Learn how to choose trekking poles based on your hiking style, body type & how you plan to use them. Learn from my experience of hiking over 500 miles per year. My wife and I spent HOURS in REI, trying to figure out the right hiking poles to meet our needs. Now it’s time for me to share that knowledge with you! More than just walking into the store and picking up the prettiest- or coolest-looking poles on the rack, you have to do a bit of research to find the right model. That research consists of learning about the different features of trekking poles, the advantages of using them, and comparing and contrasting different products’ benefits. The first step in learning how to choose trekking poles is to examine yourself as a hiker. How many times a year do you go hiking? How far do you like to hike? What kind of terrain do you like to hike over? What kind of support would you like from hiking poles? If you are a casual hiker who only hits the trails a couple of times a year then you won’t need one of the best trekking poles with all the bells and whistles. You can get by just dandy on a standard, less expensive pole. But if you’re a serious trekker who gets out there constantly, then you’re going to want a pole that’s more durable and able to support your excursions the best. If you only like to hike short distances then, like the casual hiker, you aren’t going to require a pole that’s super high tech. But if you’re like me, enjoying hikes that sometimes take the entire day, then you’ll be better off with a more supportive and comfortable pole–one that may cost a few more dollars than the standard models. In particular, an antishock trekking pole to take some of the weight off your knees. Whether you hike on flat surfaces or steep inclines, rocky land or soft ground, on the trail or in the backwoods, you’ll need a pole with the right tip, grip, and basket to get you the easiest from Point A to Point B. The support question is pretty important. Some people like to use poles because they keep their arms busy or so that they can have a tool that might get them out of a scrape later (like standing in for a broken tent pole or helping them reach something up high). There are others, though, who rely on the trekking poles to provide support for their weight. Now these, as you can probably guess, are two different types of pole. One of which is necessarily a heck of a lot tougher than the other. Figure out what kind of support you need before you pick out your poles. Once you become familiar with yourself as a hiker and what it is you truly need from a pair of trekking poles, you can begin to narrow down your search to fit your criteria. But before you can narrow down your search, you’ll need to learn what the different kinds of trekking poles are. Standard — As the category name suggests, these are the most basic trekking poles. They don’t have anti-shock properties, but they are usually lighter because of that. These are also some of the most inexpensive poles on the market. Compact/Collapsible — This combination of lineups include models that are generally shorter and feature smaller grips for people with smaller hands, and also poles that can be shortened into easily-packable sizes. Both compact and collapsible poles are lightweight models that are easy to lug around. Anti-Shock — These are more expensive poles, but they may be worth every penny, especially if you have bad knees. Anti-shock poles feature internal spring mechanisms that are designed to absorb the impact a pole makes when it comes in contact with the ground. This feature is particularly useful when you’re going downhill. There’s usually an option to turn off the feature, which is great when you’re heading uphill. Hiking Staff— The staff is generally designed as a straight pole that is best used when trekking across flat terrain with a light load. These can be even more basic than the standard variety of trekking poles, or they can feature internal anti-shock systems and even digital cameras mounted on top of the staff for taking photos of the grand vistas you encounter. These are the four basic varieties of trekking poles. Within these categories, you’ll find a wide range of prices and design quality. Once you figure out which kind of pole will suit your hiking needs the best, then you can narrow your list of possible selections down even farther. In all honesty, you should consider every aspect of a prospective trekking pole, and you should compare those aspects with other trekking poles from other brands. But for now, here are four factors that should take precedence. You absolutely cannot forget to consider these. Grip — If the pole isn’t comfortable, then it isn’t worth buying. Take the time to test out as many different types of pole as you can to see which kind of grip you like the best and is most ergonomically comfortable to you. Your choices include cork, foam and rubber. Anti-Shock vs. Non Anti-Shock— You can find anti-shock poles in a variety of different styles. You just need to decide if it’s right for you. If you’re an occasional hiker who’s in pretty good shape, then don’t worry about it. If you like to get out there often and your knees aren’t the best in the world, then you should definitely have them. Take the time to consider this carefully. After all, anti-shock trekking poles can cost a pretty penny. Price — Speaking of pretty pennies, another major factor in your trekking pole decision is the price. If you don’t need a super expensive pole, then don’t buy one. A standard pole will be just fine for the casual hiker–and even for some more avid trekkers. I would suggest you go with a mid-range pole and then use the extra money you save on a better pair of hiking boots–like some Asolo boots, for instance. Tips and Baskets— Depending on what kind of surface you like to hike, you’ll need the right tips and baskets. Baskets are great for softer ground and snow fields, while sharper tips are better for more solid terrain. If you like to hike on several kinds of surfaces, then think about picking up a pair of poles with interchangeable tips and baskets. If you can keep all this in mind when you head out to find the perfect pair of trekking poles, then I guarantee you’ll be successful. Just take the time to be prepared and you can’t go wrong! 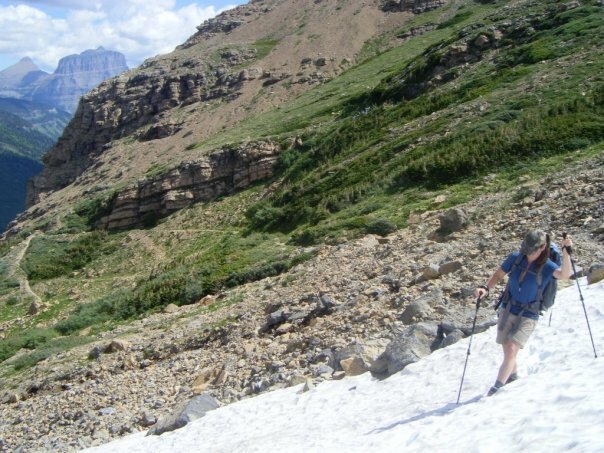 Learn more about the benefits of trekking poles. Well, that’s all the advice I can offer. Time to head back from How to Choose Trekking Poles to Hiking Pole Info.